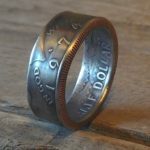 These coin rings are made from British two shillings from 1947-1952. They are made from cupronickel (75% copper 25% nickel). They can be made from size 7-12. 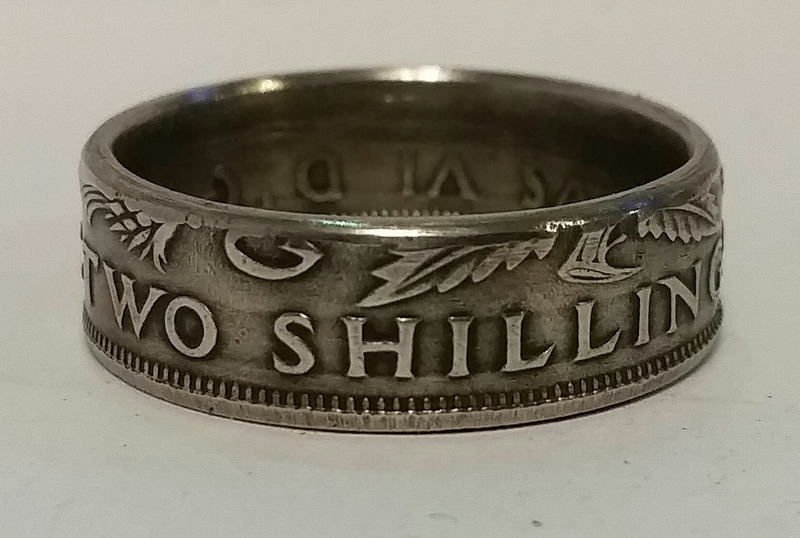 The British two shilling coin, also known as the florin or “two bob bit”, was issued from 1849 until 1967. 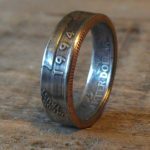 It was worth one tenth of a pound, or twenty-four old pence. 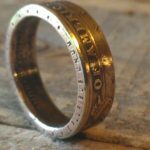 It should not be confused with the medieval gold florin, which was nominally worth six shillings. King George VI’s florins, produced each year between 1937 and 1951, look very like the one planned for his brother Edward VIII. The obverse shows the left-facing effigy of the king inscribed GEORGIVS VI D G BR OMN REX, while the reverse shows a crowned rose flanked by a thistle and shamrock, with G below the thistle and R below the shamrock, and the inscription FID DEF IND IMP TWO SHILLINGS date until 1948, and without the IND IMP from 1949, in acknowledgement of India’s independence. 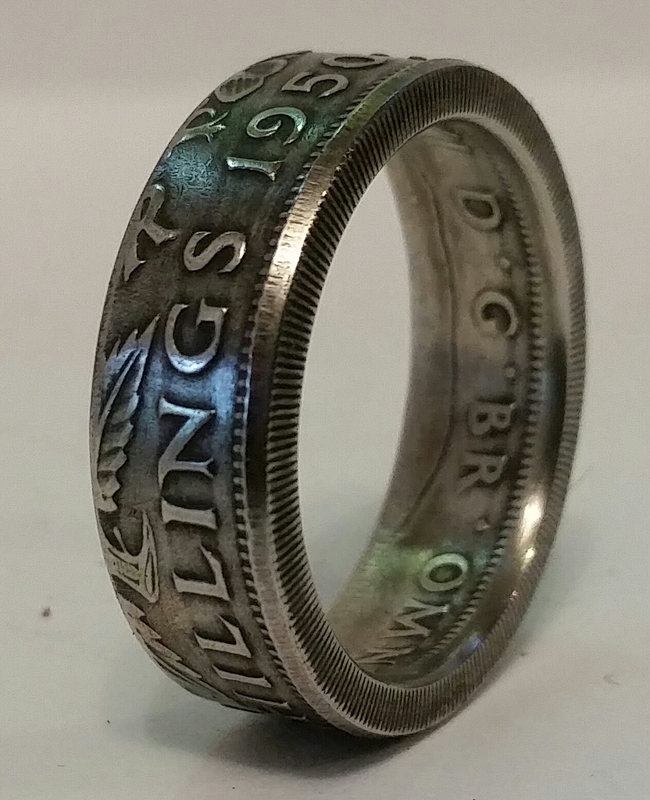 From 1947 the metal content was changed, as for all British silver coins, to 75% copper, 25% nickel. 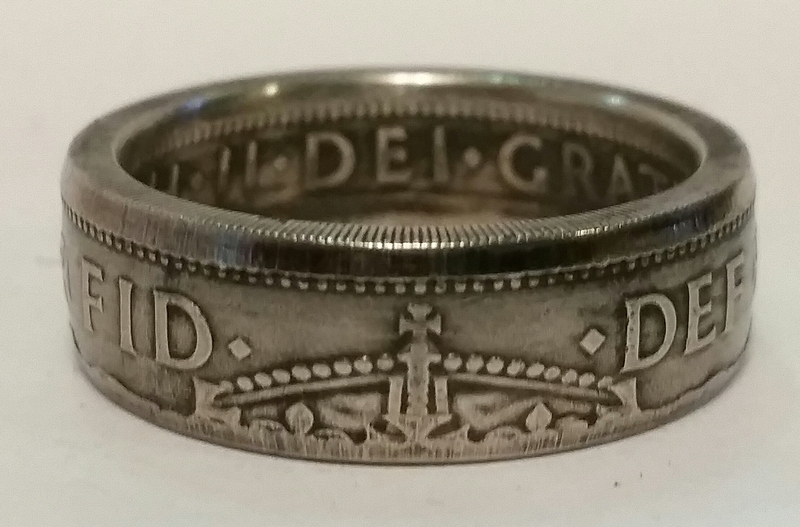 This removal of all the silver meant that most of the earlier coins which contained silver were removed from circulation fairly quickly. 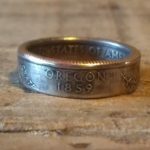 I just recieved my ring in the mail today. I absolutely love it! fits perfect! Thank you so much!